Weber is one of the most well-known names in grilling, and they continuously build some of the most reliable and innovative grills on the market. Fans of Weber natural gas BBQ grills know that they’ll get many years of outdoor cooking at an affordable price. Since 1951, Weber’s trustworthy grills have offered great cooking experiences while they continue to prove themselves as leaders in the industry. One of the Biggest Name in BBQ – Weber invented the iconic Kettle in 1952 and has continued to improve year after year. During the 1970s, Weber began manufacturing gas grills available on carts, post mounts, and in stand-alone configurations. 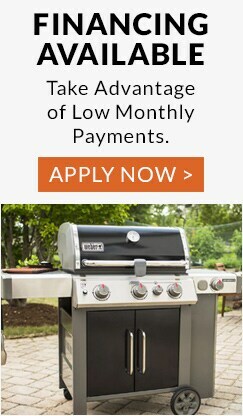 Weber has decades of experience in creating high quality natural gas grills at an affordable price. Reliable Cooking System – Weber has engineered a cooking system that minimizes hot and cold spots in their natural gas grills – creating an even and consistent cooking surface. Fans of Weber gas grills love that they know what to expect every time they cook on a Weber: excellence. 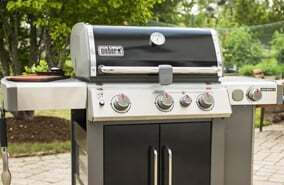 Plenty of Options – Weber natural gas grills cannot be converted to propane gas grills due to safety concerns. Because of this, Weber has created a large variety of grills available in both natural gas and propane fuel types so that consumers will be able to find the grill that best suits their needs the first time they buy a grill. The Weber Genesis II natural gas grill has a few different styles to choose from including different colors, a stainless steel lid, or in a special edition model. The freestanding grill comes in a 3 or 4 burner configuration. See our Weber Genesis II comparison chart to help decide which one will best suit your needs. The Weber Summit natural gas BBQ grill is available in either a 4 or 6 burner configuration and is the only Weber in the collection that’s available in both a built-in and freestanding option. The Weber Q 3200 natural gas grill is the only natural gas portable grill from the Weber Q collection and it’s freestanding too. To learn more about the differences between Weber natural gas grill collections, check out our Weber expert reviews. To learn more about Weber and their natural gas grills, check out the Weber brand page.